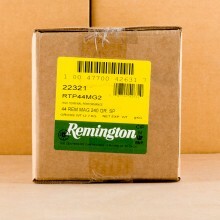 FREE SHIPPING ON BULK .44 MAGNUM AMMO! Smith and Wesson released the first revolver chambered for 44 magnum ammunition in 1956. 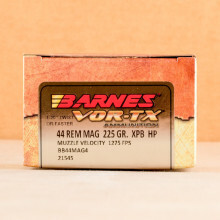 A heavy bullet that travels at extremely fast speeds for a handgun load, .44 remington magnum rounds deliver so much power and recoil that they are generally considered unacceptable for law enforcement use. 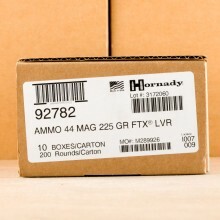 While rapid fire can be tough on a shooter's hands, the recoil hasn't stopped passionate 44 magnum shooters from embracing the round for range and self-defense use in their homes. 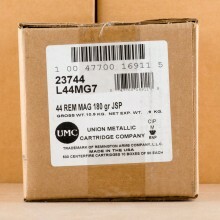 44 Magnum rounds, also known as .44 Remington Magnum, come from the mind of famed firearm writer and outdoorsman Elmer Keith. 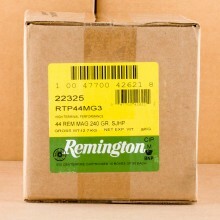 With a case that’s slightly longer than the 44 special case, mainly to keep the higher pressure magnum cartridge from being chambered in an older and weaker .44 special handgun. 44 Magnum is primarily associated with handguns/revolvers but you can also find some carbines for the caliber, like the Marlin Model 1894. 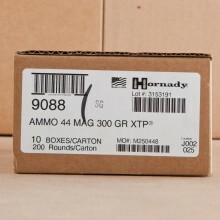 You will generally find 44 magnum ammo in stock with bullet weights ranging from 200 grain to as heavy as 340 grain for some specialty rounds. 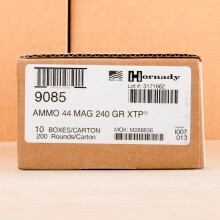 In terms of velocity, look for around 1,500 feet per second for most standard 44 magnum loads. 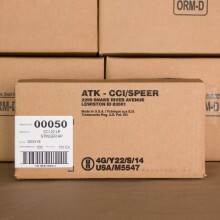 If you’re looking for a self defense round, you’ll want to find a specialty bullet of some point. 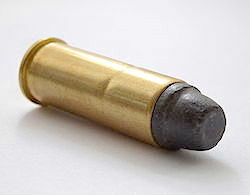 Both soft points (SP) and jacketed hollow point (JHP) projectiles are fairly common for 44 magnum shooters to use. 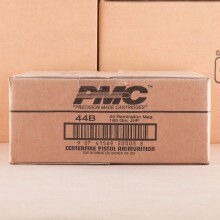 Of course, if you’re just looking to punish some paper targets at the range, full metal jacket (FMJ) rounds should be just fine! 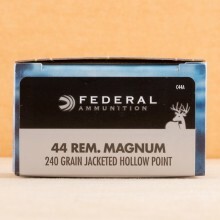 .44 Magnum shooters do use the cartridge for hunting and have had good success taking down large game with it. In fact, even some cape buffalo have been bagged using the round and Robert Petersen, a famous publisher, shot a record setting polar bear with a .44 magnum. 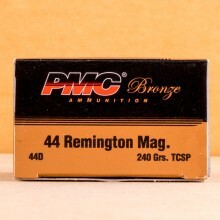 Look for 44 magnum ammo for sale from well known manufacturers like Prvi Partizan, CCI/Federal, and Winchester here at AmmoMan.com. 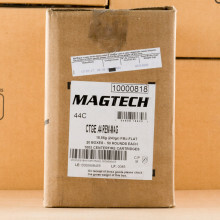 As with all calibers, your order of 44 magnum rounds ship for free in bulk.